While the media rush to blame wildfires on climate change, scientific evidence reveals there is less fire across the globe, and the credit goes to human activity. The editorial board of the Washington Post recently declared, "We won't stop California's wildfires if we don't talk about climate change." NPR reported the best way to fight wildfires in Texas is "getting real" on climate change. NBC News says extreme heat and wildfires are "made worse by climate change," according to scientists, of course. The San Francisco Chronicle sees the "fingerprints of climate change" all over those California wildfires, again, according to ScienceTM. Those articles usually quote Michael Mann, the guy behind the discredited global warming hockey stick graph, but even he won't say climate change is "literally causing the events to occur." We're just "making these events more extreme." And the media love to echo this claim. "Yes, humans have made wildfires worse," reads a graphic accompanying the Post‘s editorial on the California wildfires. An "obvious" response to the wildfires, the Post says, is "addressing global warming." 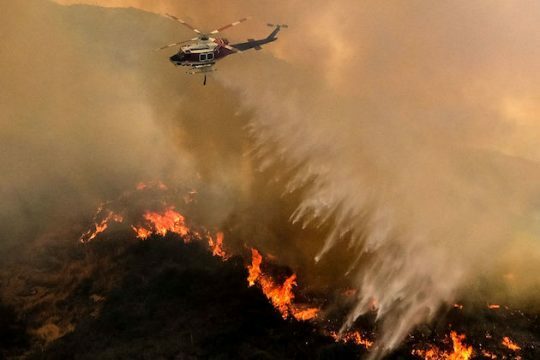 "Four of the five largest conflagrations the state has had to battle have come since 2012, according to the Los Angeles Times, and that is probably no mere coincidence," the Post says, connecting the dots. "Droughts, storms and heat waves have occurred throughout history, of course, and it is hard to attribute any single event to climate change. But scientists have concluded that climate change has increased the frequency of extreme weather and will continue to do so." One connection the media seem to have missed, however, is the one between man-made economic activity and a global decline in fires. "A human-driven decline in global burned area" was the title of a study published in Science last June and authored by climate scientists at NASA's Goddard Space Flight Center, Vrije Universiteit in Amsterdam, Columbia University, the Imperial College London, and elsewhere. The Washington Times drew attention to the study last month. The study revealed—"unexpectedly"—a robust decline in global burn area of approximately 25 percent between 1998 and 2015, largely due to human progress. "Humans have, and always have had, a major impact on wildfire activity, which is expected to increase in our warming world," the authors wrote. "[Niels] Andela [a NASA research scientist] et al. use satellite data to show that, unexpectedly, global burned area declined by ∼25% over the past 18 years, despite the influence of climate." "The decrease has been largest in savannas and grasslands because of agricultural expansion and intensification," according to the study. "The decline of burned area has consequences for predictions of future changes to the atmosphere, vegetation, and the terrestrial carbon sink." The climate scientists said burn area could decline even more, as long as agricultural progress continues in the tropics. The study found the largest declines in burn area occurred in countries with the largest increase in agricultural production. "Together, these analyses underscore the pervasive influence of human activity on global burned area, including the potential for further declines in savanna fires from ongoing agricultural development across the tropics," the study said. Another study on the "perceptions versus realities" of wildfires around the world by researchers at Swansea University concluded "there is less fire in the global landscape today than centuries ago." "Wildfire has been an important process affecting the Earth's surface and atmosphere for over 350 million years and human societies have coexisted with fire since their emergence," the authors wrote in June 2016. "Yet many consider wildfire as an accelerating problem, with widely held perceptions both in the media and scientific papers of increasing fire occurrence, severity and resulting losses." It might shock you to learn those "widely held perceptions" in the media are, once again, wrong. "However, important exceptions aside, the quantitative evidence available does not support these perceived overall trends," the scientists write. "Instead, global area burned appears to have overall declined over past decades, and there is increasing evidence that there is less fire in the global landscape today than centuries ago." The authors also point out the dangerous policies of 100 percent "fire exclusion," which derives from the German forestry school of the 19th century, as proven to be "impractical, unsustainable and ecologically detrimental in fire-prone regions." The perception that all fire is bad, i.e., Smokey the Bear (Trump ahead of the curve again! ), still pervades American media coverage and policy, as the authors point out the detrimental effects of fire suppression. "The media still promote perceptions of wildfire as the enemy even in very fire-prone regions, such as the western USA," the authors write. "Achieving a more balanced and realistic perspective about fire occurrence, its risks and impacts among fire specialists, decisions makers and the wider public is perhaps the most critical step towards regaining a more sustainable coexistence with landscape fires." A "more balanced and realistic" perspective from the media when it comes to climate change? Good luck with that.